This is movie where students show the different ways we produce electricity in the United States. What do you think is the best way? Here is video of the students making "Beakman's Simple Motor" which is not so simple as the kids found out. Enjoy the video. ON Monday the 29th, our class did a project on static electricity. Here is a animation on it. On February 8, 2011, our school saw the Street Beet. They came to our school to show us what they basically do. When we first thought of this idea, ( well the LPTO did) they were just going to perform in front of our class, but in the end they performed in front of the whole school. When we got to the gym, they started explaining a little about them self's. They told us about how they used trash cans, metal objects, and 5 gallon buckets for instruments! Then they played on their so called instruments and asked us a few questions. Also made us do clap and respond. That is when they do a clap, and we have to do it back. After that they showed us that, they did this really cool thing that had 100 notes in it! That was the grand finally. They did that because it was the 100th day of school. During the month of January the students explored the Civil Rights movement and in particular the March on Washington on Aug 28, 1963. The movie below shows that special day in American history when Martin Luther King Jr. gave his famous "I Have a Dream" speech. Enjoy the movie! Students Published Their Own "Snowmen at Night Stories"
For two weeks before the holiday the fourth grade classroom turned in a writing and publishing room. The whole adventure became when Mr. Ferguson read Snowmen at Night by Caralyn and Mark Buehner and then asked the students what they thought snowmen did at night. The student's minds go rolling and storyboards began to form. Midway through the adventure, Mr. Ferguson contact the authors to share the excitement and they wanted to read the stories. With a real audience waiting for the final product, students kicked into high gear and started drawing and revising their writing. On the last day before vacation students binded their stories, made copies for the author and helped each other along the way. Now they are waiting to hear from the author and hope to gain valuable advice on how to be better writer and illustrator. Thanks Mark and Caralyn for enhancing the student's learning and taking the time. Below is a collection of the 17 different snowmen stories. To see photos of the students in action visit the "Snowmen Stories" under the project heading. Individual stories can be found the student's web page. This holiday season the fourth grade discussed how they would like to celebrate the holiday season. This year the students wanted to spread the spirit of the holiday by raising money for the Bancroft House, a local safe shelter, . 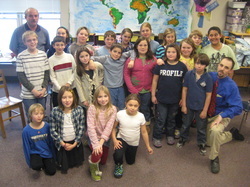 Each student made a personal donation and when it was all counted up they raised $123 dollars for the homeless shelter. On the last day before vacation, the manager of the Bancroft House, came in and talked about the importance of a homeless and what they provide to the community. He was extremely impressed with the generosity of the students. Way to go fourth graders! This past month two of students have seen an orthopedic surgeon for various injuries. This has injected curiosity in the orthopedic medical field. Two miles up the road, we are very fortunate to have a world class orthopedic surgeon, Dr. Chen, who has performed surgeries on athletes to Olympians. It was a perfect combination and Dr. Chen was willing to share his knowledge and expertise with our students. To prepare for Dr. Chen, the students had a mini medical school for two weeks and learned about the skeleton and muscular system in the body. On Friday, November 19th student traveled to the Alpine Clinic where they met Dr. Chen and his team. For two and half hours the students were treated like potential doctors and received a first class tour. They learned about physical therapy, how to put a cast on, x -rays, MRI scans. In the end the students tested their knowledge and looked at various X-rays. Below is animation that shows the students learning of the skeleton system, and photos of the field trip. Enjoy.